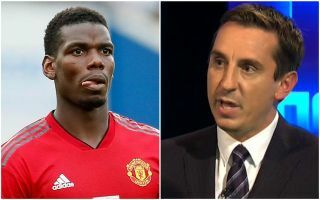 Much has been said about Paul Pogba and his future at Man Utd amid ongoing speculation, and now Gary Neville has shared his views on the matter. As noted by The Express, the French international continues to be linked with an exit while as per The Guardian, he seemingly sparked all the talk initially by suggesting that he isn’t entirely happy at Old Trafford. Given the quality that he possesses and the importance he holds for the Red Devils, it will undoubtedly be a blow for them if he was to leave the club for a second time as it would leave a significant void in midfield that would have to be filled. Nevertheless, Neville has looked at it from different viewpoints, and while seemingly warning Pogba that he is essentially not bigger than the club and shouldn’t allow himself to be seen as a mercenary, he has delivered an intriguing analysis of it all with a balanced opinion across the board. “Neville the pundit on Pogba would say, ‘He’s a talented player but I want to see more consistency and leadership,'” he told The Times. “As a fan, honestly, part of me is that no one is bigger than the club and I am not interested in people who are looking left and right. “So Paul, if you want to go play somewhere else, let’s make that work for you because Manchester United will be fine, don’t worry about that. Neville has carved out a career as an excellent pundit on Sky Sports, and this is just another example of why he’s so highly regarded as he offers insight and a rounded argument. He’s ultimately got it spot on from various angles in this assessment, as he’ll undoubtedly want to see Pogba flourish at his old club, but it’s important to remember from Man Utd’s perspective that they must control the situation and there is a level of responsibility that Pogba must remember to avoid coming off badly in this whole affair too. Time will tell how the situation plays out, but the best response that the World Cup winner can surely deliver for now is to consistently deliver on the pitch where it really matters to silence talk of an exit from Man Utd until January at least.